I don’t really want to compare Global Metal with Metal: A Headbanger’s Journey, but when in the introduction, our familiar world weary anthropologist metal-head from that film, Sam Dunn, reminds us that he did indeed make a film about metal culture before this one, it’s hard not too. And in that sense, this is the inferior documentary, but by no means a bad or uninteresting one. I’m not sure if it was ever supposed to be viewed as a “sequel”, but specifically, Global Metal does just feel more of an afterthought and lacks the weight, enthusiasm and resources of it’s predecessor to carry it through completely. Perhaps the passion of our buoyant young filmmakers has dwindled after the successful first film, or maybe it would have faired better as a TV special or series, because trying to be another cinematic looking feature doco, that AHJ was so successful at being, is probably it’s biggest downfall - at least in the beginning. The travelling focuses on Asian culture the most, but we start in Brazil which probably has the biggest metal following in history out of all the countries visited. This is mainly pinned down to a staging of a gigantic 10 day festival, ‘Rock in Rio’ in 1985, which saw over one million Brazilians embrace the term “metal-head”. Ironically, this is where Global Metal struggles a bit to maintain interest. Though the mammoth crowd shots are impressive, there’s little added to it’s importance beyond that the country then went on to produce the hugely world wide popular band, Sepultura - with one observer claiming they are as important to Brazil as “Pele or the Amazon”. Given Dunn’s eventual intent though, it’s easy to see why dwelling on the band and their influence would have been missing the point. As we travel to more obscure realms, it’s clear Dunn looks slightly bemused (but almost awed as well) when faced with how underground metal actually is in places such as India where no major metal bands have ever even played. On the other hand is China, who also has had no major metal gigs, and needing import bootleg CD’s to discover even the most bland western music, still thrives and produces world class metal. The contrasts throughout are very interesting, and provide the beginning of a much more intriguing element to the doco. Ultimately, I don’t think they’re explored enough at the start - I kind of felt a little cheated each time we moved cities, asking myself, “that’s as far as we’re going?”. I was hoping seeing fifty kids embracing a local metal gig in India wasn’t the point here, while at the same time understanding that when you simply don’t have material to use, you can only stretch it out so much. It turns out the ‘meat’ of the doco is saved for the more controversial of major cities. Arriving in Indonesia we witness that, unlike similarly hugely populated countries like India and China, Indonesia has been fairly well exposed to metal which culminated in a massive Metallica concert in the early 90’s, leading to all rock gigs being banned on account of some ticket holders - who were not let into the show - tearing up the streets in their frustration. 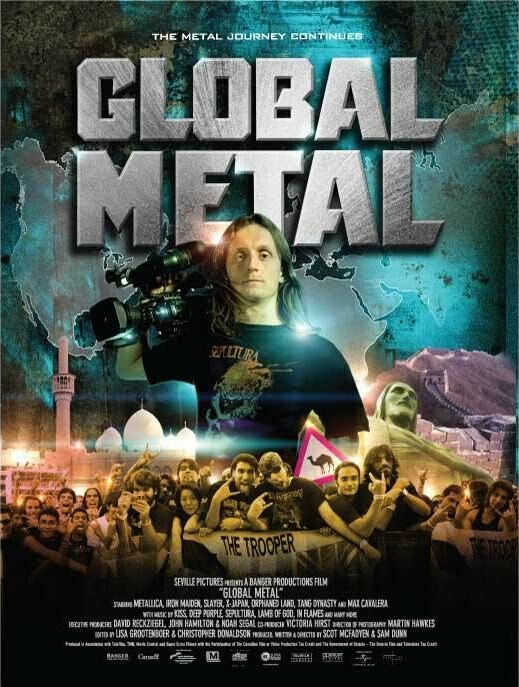 The footage of the actual concert amidst the chaos is compelling and Dunn does well to lead the film into a more religious themed topic of what it is like to be a young metal loving Muslim in a post 9-11 world. By the time we get to Israel and Dubai, the point and the relevance of the religious ties to metal is at the forefront. Perhaps I was just being impatient with GM, because Dunn’s anthropological spirit shines through in the last half of the film and we’re left with an eye opening, well made, if sometimes disjointed look at how universal metal is as an art form, regardless of culture, and indeed that it can be a very positive thing in the right places. Considering that was probably the doco’s point too, I say good effort. The Iron Maiden concert climax is brief, but a fitting closure and confirms that AHJ was no fluke. It seems Dunn and co. have cornered the market of metal on film.